GENEVA -- The "Oppenheimer Blue" diamond sold Wednesday for more than 56.8 million Swiss francs ($57.6 million) including fees, crushing the previous record for the most expensive diamond ever sold at auction. Capping a lively and even laughter-filled auction at Christie's, the hammer came down to applause as the 14.62-carat stone, billed as the largest Vivid Blue diamond ever put up for auction, went to an unidentified buyer for a hammer price of 50.6 million Swiss francs - which excluded fees and the buyer's premium. The final tally also blew away the previous record for a diamond sold at auction by nearly $10 million: The 12.03-carat polished "Blue Moon" diamond went for $48.5 million in Geneva in November. 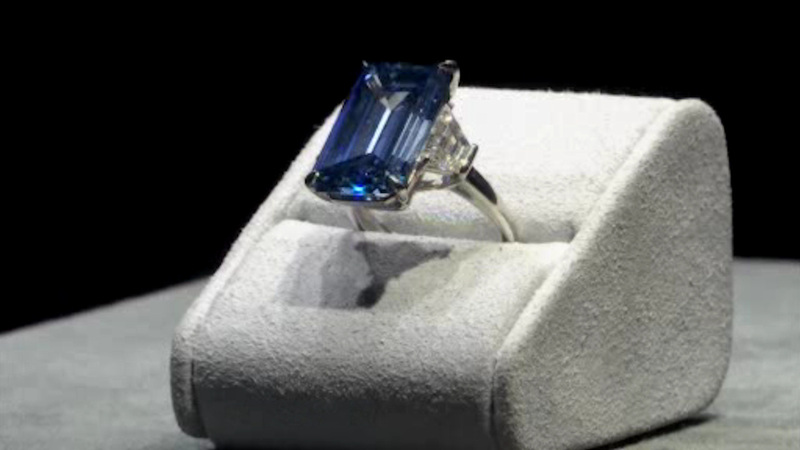 Christie's spokeswoman Alexandra Kindermann said the bidding for the "Oppenheimer Blue" lasted over 25 minutes for the single lot, after starting at 30 million francs. The anticipation was often marked with tense pauses, groans and laughter. In diamond-business parlance, "provenance" matters. Raymond Sancroft-Baker, Christie's director of European jewelry, said Oppenheimer "had the pick of all diamonds over a 50-year period, and this is what he picked out for his wife." "There's been several other blue diamonds which have been sold in the past, but nothing really quite of this quality," Sancroft-Baker said, adding that while the stone wasn't internally flawless, it was "nearly perfect." The sale rounded out a two-day run of big-ticket jewelry auctions in Geneva. At Sotheby's on Tuesday, a vivid, pearl-shaped pink diamond said to be the largest of its kind to go under the hammer sold for 27.3 million Swiss francs ($28 million) - at the low end of the pre-sale estimated price range.